Containment Protocols: RPC-988 is to be monitored and kept within the Anomalous Item Storage Unit located in Site-16. Should RPC-988 ever become active, an electromagnetic pulse is to be delivered to temporarily disable it. Description: RPC-988 is a Checker Marathon painted yellow with a long checkered stripe running along the body of the car and a bumper with the words "JEFF'S CHECKER". 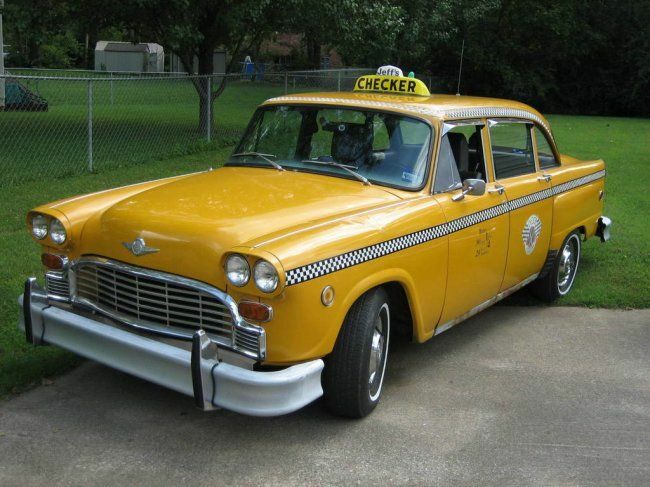 Visually, RPC-988 does not differ from other Checker Taxicabs of its time. Inside RPC-988 is a small Bop'n Heads Wizard Bobble Head, this item cannot be removed. Instead of a gear shift stick, there is a touchscreen tablet with no discernible traits. When the driver swipes up on the tablet, the car will enter the equivalent of the "Drive" shift, when the driver swipes down, the car will enter the equivalent of the "Reverse" shift. Once a "gear" has been selected, RPC-988 will function as a normal Checker Marathon. Inscriptions that are not featured in the pamphlet will not work. Inside RPC-988's glove box is a small pamphlet titled "Instruction Manual". Inside are several inscriptions with names that can be input into the tablet. The pamphlet also details what situations these could be used in and how they work, often calling upon another magical entity called "Horus Raidsh". "Goros Macham" When activated, causes four, red luminescent arms to grow from each door. In unison, these arms are strong enough to lift up RPC-988 off the ground for an indefinite amount of time. Activated by drawing two (2) vertical lines on the tablet. "Division is hard" When activated, RPC-988 begins to multiply itself into several, 4 to 28, exact replicas. These replicas dissipate after 3 to 12 hours. Activated by creating 6 dots on the tablet in straight line. "Transforma" RPC-988 will transform to match its current environment. When in the same environment, it will often transform into a faster vehicle, often changing the type of automobile. Activated by drawing a "T" on the tablet. "For when I have to take it apart" RPC-988 will begin to break down into basic components. This does not harm anyone inside RPC-988. Activated by drawing 6 dots in a scattered pattern on the tablet. "Cool spell name" A portal will appear 10 meters in front of RPC-988. It is unknown where this portal leads to as the driver and passengers do not recall their time located within the portal. Activated by drawing a circle on the tablet with a smaller dot inside the first circle. The back page of the pamphlet reveals the name John Raymond Stein Lawrence (shortened to Lawrence). Lawrence is a 58 year old man living in ██████, New York. He was interviewed by the Authority as soon as he was found, below is the interview log. Dr: L. Osis: Hello there Mr. Lawrence, I am Dr. Levi Osis. Lawrence: What is it you need, doctor? Dr. L. Osis: I'm here to ask you about a particular taxicab that apparently belongs to you. Lawrence: Ah, you found that old thing? I guess I must have left a few spells on there. Dr. L. Osis: Care to elaborate? Lawrence: Yes, you see, being skilled in magic isn't very helpful in today's society. Either people don't believe you or the government just comes in and kidnaps you. Lawrence: At first, I was a self-proclaimed psychic, but people didn't really believe me. I then moved onto palm reading, then as a magician and then finally decided to become a taxi service. Lawrence: Then I realized, "Just because I don't work in magic doesn't mean I can't use it for personal reasons". And so, I cast a couple of spells on it, made a few modifications and then sold it on Craigslist. I assume this is how you found this so-called "RPC-988", yes? Dr. L. Osis: How did you know about RPC-988's classification? Dr. L. Osis: Ok, but why did you create RPC-988? Lawrence: Were you not paying attention to anything I was saying? Dr. L. Osis: Last question, who is this "Horus Raidsh" you mention in your pamphlet? Lawrence: How dense are you that you don't see it just says "horse radish". Dr. L. Osis: Thank you for your time, Mr. Lawrence.